Are you thinking about starting a new construction or remodeling project for a house or cabin? Do you plan to stay there for a while? You might want to think about building for accessibility now, during the planning process to help your long-term happiness in your new or remodeled home. When we’re young, we don’t think about certain future needs. Sure we are investing for retirement, saving so our children can go to college, maybe building a business that will fund all of these plans. If you’re building a home or cabin, you will be putting your planning skills to work, include more long-term thoughts in your plans, too. When we’re in our prime, we don’t think about stairs in a house or a hill going to a parking location or our lake dock. When we get older, those stairs are going to be a bit more challenging. Planning now means you don’t have to build a single story house if you really want a multi-level home and you can stay in it as long as you want. There are lots of items to think about when building or remodeling a house, paint colors, flooring materials, trim, siding, windows, the list gets pretty long. Don’t worry, the answers all fall into place as you go. Take some time to add a few more important decisions to your list that will make your life easier now and as you age. It used to be that the laundry was out of sight, out of mind AND far from the bedrooms. With a multi-floor home, put the laundry where it is convenient, by the bedrooms. This way you’re not lugging baskets of dirty laundry downstairs and clean back up. This will make your life much easier today and down the road. Then you’re not looking to find a way to move them closer to where everything is used and stored in fifteen years. Some homes now are even incorporating multiple laundry spaces, one for the kids and another for the master suite. Square footage is still precious and expensive, but the long-term benefits outweigh the costs. We can all hope for a long, active and comfortable retirement, but that may not be the case. Many people require the use of walkers or wheelchairs as they age. Even an accident may have you or your child using crutches or a scooter for a short time. A lot of hallways are built at 36” wide, but going to 48” will allow a person in a wheelchair and an ambulatory person to meet comfortably in a hall. Likewise, many homes are build with 32” doors. Upgrading to 36” doors will allow for easier wheelchair maneuverability in the future if needed. Besides, think about how much easier move-in will be with wider doors and hallways. Talking about doors, look for lever type door handles. They are much easier for older hands to operate and, they are great anytime you have your hands full. Building codes will determine set-backs and some placement issues. But, look at your site plan with an eye for the future. I’ve seen lots of home built up on a hill for a great view in a crowded city, but their garage is down a 20 foot incline. They have beautiful landscaping and built-in stairs. On the other hand there are spectacular cabins with lake views to die for. 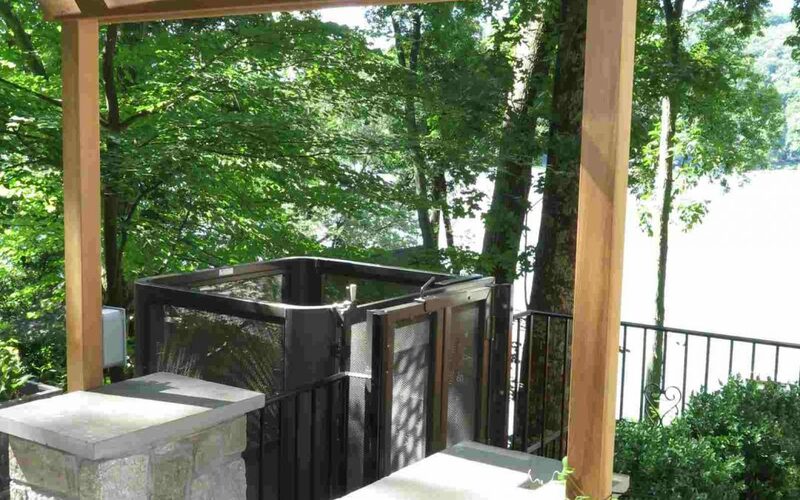 They have a winding staircase through a lush garden to get to the water. Both of these look exceptional on paper when we’re young and spry. But planning now can allow for placement to accommodate a hillside tram or lake elevator in the future. They don’t take much space, but proper planning will make the addition easy when the time comes. Besides, the time for a lift may be sooner than you think – carrying groceries from the car to the kitchen or hauling kids and boating supplies to the dock for a day on the water, both can be chores that a inclined elevator makes effortless. We might not want to think about it today, but there may be a time when all those steps are too much, but we don’t want to leave our home. We enjoy our space, we love our views, it’s home. A little foresight will solve that problem. Today’s residential vertical elevators are compact and efficient. Many can be adapted into a current home. With proper planning, you can make some very slight design changes so it will have the required support, clearance and location so it will fit and look like it was in the original plan (because it was). Assuming you don’t need the elevator, no one besides you and your architect will know it was in the plans. If the time comes, the elevator can be easily installed. We have all heard someone say “Plan your work and work your plan.” This is sage advice for the home you’re building or remodeling. Plan for the future and your future will be smooth. Make a few more check boxes as you start plannng and you’ll be comfortable for decades to come. 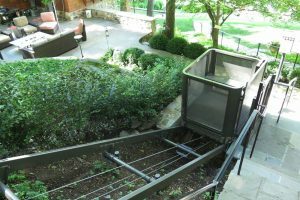 Contact Marine Innovations to discuss how a hillside tram can help you plan for accessibility. Are you ready to start building for accessibility? Contact us for a free quote today.